You pretty much can’t get away from bacon or whiskey in the South. Put a doughnut in it and you’d be good to go. Braised bacon, what a concept and I’m definitely on board for this new version of spaghetti carbonara, my problem was finding the slab bacon, but a neighbor called me from a pork market and I ended up with 1 side of cured bacon and 1 side of peppered cured bacon, at $2.99 lb. a bargain compared to the supermarket prices and BTW why the heck is cheap bacon/center cut demanding such a high price? 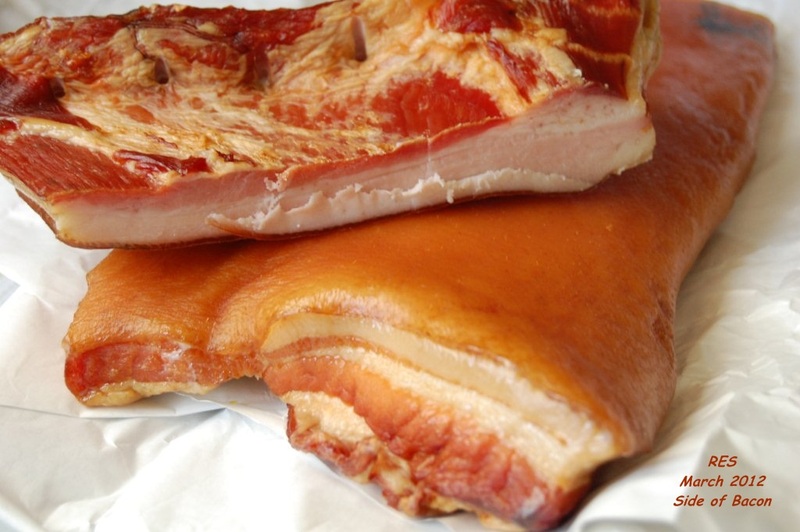 Buy a slab, cut the ends, and slice thin, save the ends…Personally I think CC bacon is a rip-off. The slow braise tames the salty-smoky character of the bacon, mellowing the flavor and giving it a meatier, less floppy texture. Once braised, bacon enhances all sorts of dishes and is especially good with eggs, salads, and pasta. 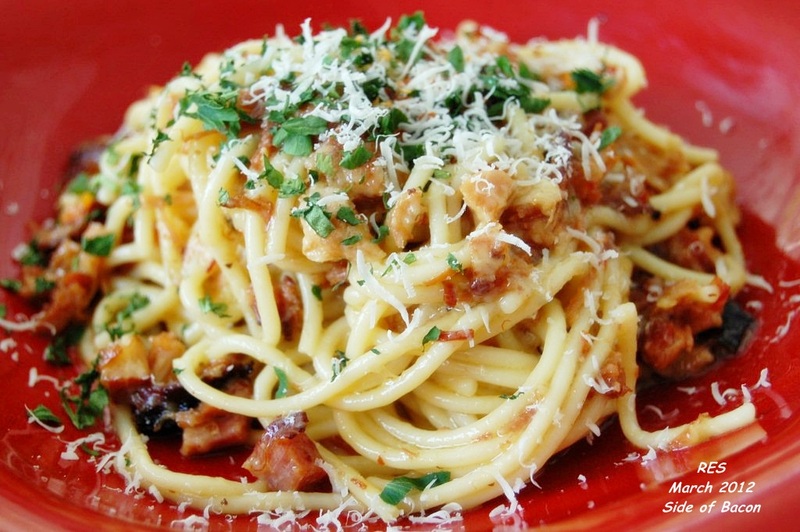 My favorite thing to do with braised bacon, however, is make spaghetti alla carbonara. It transforms this familiar bacon-and-egg pasta dish into something altogether sublime. Don’t be shy about braising more bacon than the recipe calls for. 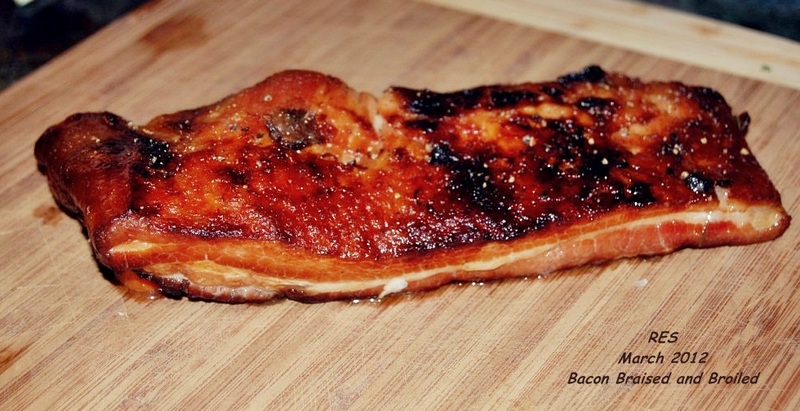 Braised bacon keeps well in the refrigerator, and you’ll have no trouble discovering other ways to serve it. Before adding the bacon to anything, warm it in the braising liquid or sauté briefly in drippings or olive oil. 1. Heat the oven to 275 degrees. 2. Blanching the bacon: Put the bacon into a medium saucepan (if you need to cut the bacon into two pieces to fit, do so) and cover with cold water. Bring to a boil over medium-high heat, reduce to a steady simmer, and cook for 5 to 7 minutes. Drain. 3. 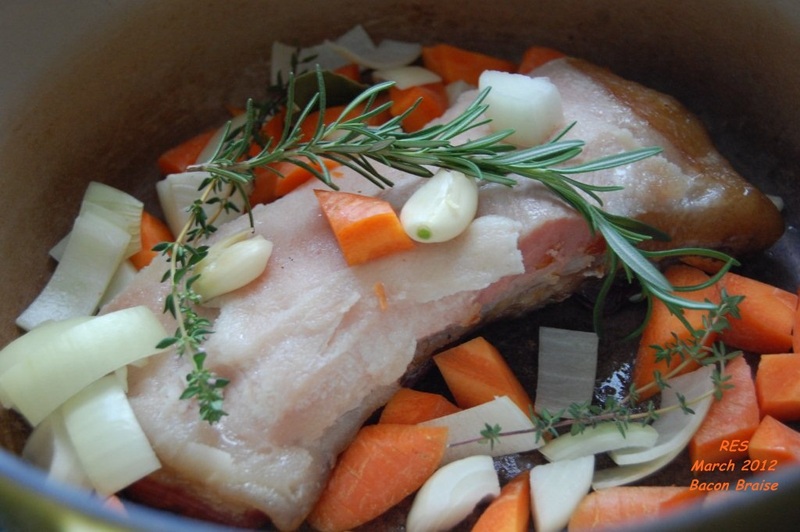 The aromatics and braising liquid: Choose a heavy tight-lidded flame proof pot that will accommodate the bacon snugly. Again, don’t hesitate to cut the bacon into two or three pieces to fit—ultimately it will be cut into cubes. Put the carrot, onion, garlic, rosemary or thyme, bay leaf, and peppercorns in the pan. Set the bacon on top, fat side up, and pour in the stock (or water) and wine. The liquid should come about halfway up the sides of the meat; if not, add a bit more stock (or water). Bring the liquid to a steady simmer over medium-high heat. Lay a piece of parchment paper over the top, pressing down so it nearly touches the meat and the edges of the paper extend over the sides of the pot by about an inch, then cover with the lid. 4. 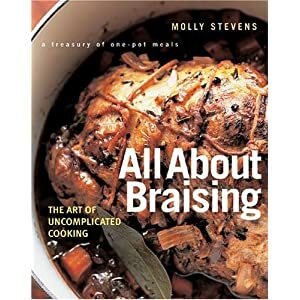 The braise: Place the bacon in the middle of the oven and braise at a gentle simmer, basting and turning once or twice, until completely tender, 2 1/2 to 3 hours. You should be able to easily pierce the meat with a regular table fork. Remove from the oven, and turn the broiler on high. 5. Browning the bacon: As soon as the broiler is hot, slide the bacon under it so that it is about 4 inches away from the heating element. Broil, turning once with tongs, until you hear sizzling and popping sounds and the surface is brown and crisp, 3 to 8 minutes per side, depending on the strength of your broiler. Remove from the broiler and let the bacon cool to room temperature in the braising liquid. 6. Degreasing the braising liquid: Transfer the bacon to a cutting board. Tilt the pot and skim off the fat on the surface—there may be as much as 1/2 cup. Strain the braising liquid, and discard the vegetables. If you are not making the pasta right away, return the bacon to the braising liquid, cover, and refrigerate until ready to use (up to 1 week). If you are making the pasta right away, taste the braising liquid. It should have a pleasant broth-like flavor, but occasionally, depending on the bacon, the braising liquid will have an overpowering smoky taste—in which case, discard it. But if you like the flavor, save the liquid for another use (such as cooking vegetables, adding to soups, or adding to another braise). 7. Making the pasta sauce: Bring a large pot of water to a boil. Cut the bacon into large dice (about 1/2-inch cubes). You should have a generous cup. Heat the oil in a medium skillet (9- to 10-inch) over medium heat. Add the bacon and garlic and sauté, shaking frequently, to crisp the bacon on all sides. As soon as the garlic cloves are golden, about 3 minutes, remove and discard them—this will probably happen before the bacon is ready, but continue sautéing the bacon until crisp, 10 to 12 minutes. Add the wine and simmer to reduce by about half, 10 to 12 minutes. Set aside in a warm corner of the stove. 8. Cooking the pasta: When the pasta water boils, add a handful of salt (about 2 tablespoons) and the pasta, stir once or twice, and boil vigorously until it’s al dente. While the pasta boils, break the eggs into a small bowl, add a pinch of salt, and lightly beat them. Set aside. Drain the pasta, reserving 1/2 of the cooking water. 9. The finish: Transfer the pasta to a warm serving bowl. Gradually pour 1/4 cup of the reserved pasta cooking water into the eggs, whisking constantly to prevent the eggs from curdling. Whisk in the cheese and parsley. Immediately pour the egg-cheese mixture over the pasta and toss with tongs or two large wooden spoons so that it thoroughly coats all the strands of pasta. Quickly rewarm the bacon and wine over high heat, and immediately pour it over the pasta. Toss. If the pasta seems dry, add some or all of the remaining pasta cooking water. Season with a few generous grinds of black pepper and serve right away. Pass more cheese at the table. Posted on March 28, 2012 March 28, 2012 by ibbeachnanaPosted in Braises, Carbonara Recipes, Pasta Main dishesTagged Braises, Carbonara, Pasta and others.